The ardour of the search for ‘the next big thing’ in the international property market may have cooled as those who made unwise investments lick their wounds, but there is one new destination outside the canon of ‘safe havens’ that looks as if it’s here to stay. Unusual in many ways, Montenegro offers a heady mixture of the modern and the traditional, bridging, as it does, the well-established tourist destination of Croatia and the untouched charms of Albania. 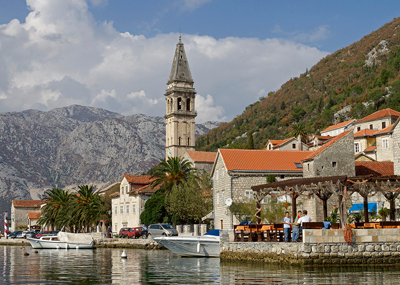 It’s easy to get to by air via Tivat, or by driving from Dubrovnik (two hours); the country has joined the Euro and proves to be extremely affordable. The government has a strategic approach to development and has worked with a few select luxury brands that, it’s hoped, can do justice to this ravishing part of the world without spoiling its natural charms. Because of the country’s strategic position along the Adriatic coastline, Montenegrin history is peppered with invaders and overlords, including the Venetians and the fearsome Ottomans. The Austro-Hungarian empire exerted its influence at the start of the 20th century, but after 1918, the country was assimilated into the former Yugloslavia, and became independent only in 2006, following the long and bloody Balkan conflict. This tempestuous history has left its people fiercely patriotic and grateful to its dramatic terrain: its steeply inclined fjords and wild mountain landscapes have provided excellent rebel hideouts over the centuries, although the white sand beaches represent a softer side of the country’s personality today. The beautiful Venetian walled city of Kotor is a mini-Dubrovnik, with warrens of streets peppered with boutique hotels, churches, little squares and cats peeping around every corner. It’s utterly charming, and marred only by the crowds who are disgorged from the cruise ships that come into Kotor Bay every morning. Of course, Montenegro isn’t entirely undiscovered: it was an extremely sophisticated destination in the 1950s, when Elizabeth Taylor and Richard Burton were drawn to the natural beauty of Sveti Stefan, a romantic fortified island resort. Before that, George Bernard Shaw had wondered whether he was in Paradise or on the Moon upon reaching the summit of the sacred mountain of Lovcen. If buying a period property doesn’t appeal, the most recent round of modern development began in 2009 with Porto Montenegro. Previously a historic naval base, investors-including Canadian businessman Peter Munk and Nat Rothschild-identified the ideal location to fulfil the overwhelming need for more super-yacht berths in the Mediterranean, and the successful project brought an injection of serious cool to the area. Porto Montenegro is now well established and offers waterside properties, a state-of-the-art marina, which is due to expand, and the exclusive Purobeach Bar, which offers an Olympic-sized infinity pool and cocktails as you relax. The Regent Porto Montenegro, a new five-star hotel and residences development, is set to open in May 2014. Designed by Tino Zervudachi of Mlinaric, Henry & Zervudachi, and with landscaping by Martin Lane Fox, the properties are top of the range, and start at €245,000; luxury apartments cost about €6 million. ‘The property market is still in its infancy, and therefore represents good value for money when compared to Croatia and Italy,’ he notes. ‘Prices in Montenegro are currently about 40% lower than Croatia and we benefit from being part of the Eurozone.’ One new development piquing the interest of British buyers is currently rising up in the pine-covered hills above Kotor Bay. There are to be 50 two- and three-bedroom villas planned on a three-acre site as part of Sea Breeze, with a layout inspired by the traditional Dalmatian hilltowns, and 12 have already been sold. Each villa will have open-plan living spaces, a private pool, a wine cellar and a humidor, with smart-home systems, all just 10 minutes from Kotor itself, and close to two PGA golf courses. Prices start at just €399,000 for a two-bedroom villa and go up to €899,000 for a 243sq m threebedroom villa. For more details, contact Seabreeze on 00 38 32331 555 or visit www.seabreeze.me. A second new development you can’t ignore along this Adriatic coastline is Luštica Bay on the Luštica peninsula, also near Tivat. Conceived on an enormous scale, the development has plans for hotels, private residences, two marinas and a golf course. Phase one has two hotels and more than 150 residences due for completion in 2016, and the completed project in 2025 will have shopping, dining, school and even medical facilities, essentially creating a completely new community for this pretty peninsula. The architectural design is inspired by the natural character of the area-each property will be constructed using sustainable local materials-and 95% of the marina apartments will benefit from sea views. Marina town homes start at €565,000, which is roughly £480,300. For further information, visit www.lusticabay.com.